“Dance is the hidden language of the soul”. As much as this quote of Martha Graham illuminates the pinnacle of dancing sensibilities, a team of nine dancers of Bangalore under the mentorship of Sri Kiran Subramanyam attempt to decipher such meaning and reach out to their souls through Maanini. A multilayered textural presentation of basic grammar of Bharatanatyam, Maanini is a revelation of both the rhythmic and expressional elements in a formatted group choreography. When Bangalore is busy bargaining with a gloomy weather for Diwali celebrations, I meet this team drenched in sweat after a grueling practice session, who were kind enough to give an animated preview. All of them voice in unison that trained to the professional brim in different schools, adapting to a particular technique, though consumed time, challenged them thoroughly. During the three month tenure of instruction, it was the experience of learning and weaving intricate rhythmic patterns with core calculations and maths into their presentation that was a great import in the dancers’ career. Courtesy that Sri Kiran’s forte lies in this genre of choreography, the dancers recognize and acknowledge the opportune moment of such previlige and thorough work. Apart from imbibing from each other’s strengths and style of dancing, it is a seamless harmony that they vouch for as a strong foundation, hoping sincerely that it would show off on stage. Talking of his delineation towards the concept of Ashtanayika, Sri Kiran explicates of woman psychology being interpreted through these states of ‘being’ and how it was an intense activity to analyse emotional natures of each of the dancers and give them roles that would best suit or bring out hitherto unattempted performances. Converging such multiple expressions of love towards a single stretch of a varnam was according to him a united juxtaposition of his vision, sketching of a situation whilst allowing freedom over responsibility and suggestive ability on the part of the dancer, to which the dancers readily agree asserting it to be a journey of self-introspection and a mirror of their day-to-day emotions. Being the innate perfectionist, Sri Kiran has ensued the best of musicians, technical and administrative arrangements towards the production and his team of dancers are more than awaiting to paint coloured flavours on the stage! Premiering this in culture conscious Bangalore,they feel, is only humbling what with the abundance of talent and cultivated audience for classical arts. While the team gears up for performance and enjoy sweet nothings of a very pleasant bond built, Kalaparva wishes them the best and invites audience to come and watch Maanini which,premiers on Friday, 20th November, 2015 at ADA Rangamandira, JC Road, Bengaluru at 6 PM. 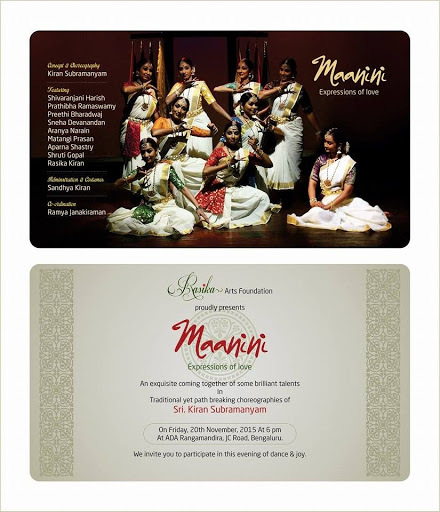 Featured artistes are Shivaranjini Harish, Prathibha Ramaswamy, Preethi Bharadwaj, Sneha Devanandan, Aranya Narain, Matangi Prasan, Aparna Shastry, Shruti Gopal and Rasika Kiran. Concept and Choreography by Sri Kiran Subramanyam, Administration and Costumes by Smt. Sandhya Kiran and Co-ordination by Ramya Janakiraman.